Due to engine problems, the Wings of Freedom Tour had to stop in Oklahoma City. The aircraft will arrive at the Mid America Air Museum once the issues have resolved. The arrival is tentatively scheduled for 6:00pm this evening. 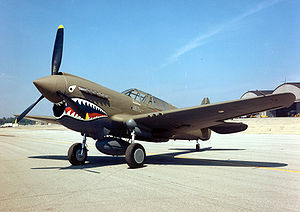 According to Bob Immel, Director of the Mid America Air Museum, the Collins Foundation has added a P40 Warhawk aircraft to the Wings of Freedom Tour that will be landing at the Air Museum Monday afternoon. The P40 is a dual control aircraft and “stick time” will also be available. Now five of the most famous WWII bomber and fighter aircraft will be coming to Liberal as part of the Wings of Freedom Tour. The Tours schedule at Liberal’s Mid America Air Museum, is Mar 25th from 2:00pm-5:00pm, March 26th from 9:30am-5:00pm and March 27th from 9:30am-12:00pm.Tour the beautifully restored aircraft and even take to the skies yourself in an ultimate flight experience aboard the bombers. Get some “stick time” in a full Dual Control P-51D Mustang and the P40 Warhawk! 30 minute B-17 or B-24 flights are $400. P-51 flight training is $2400 for a half an hour and $3400 for a full hour. P40 flight training is $2200 for a half an hour. The majority of your flight is tax deductible as the Collins Foundation is a not for profit 501c3.